Most people apply foundation with either a brush or sponge. I use a dense, round brush with a flat top and that really allows me to create that flawless base, but sometimes it can take a while to apply a full face of makeup and foundation is something that works better when applied as soon as possible in order to create that gorgeous airbrushed look. What if there was a tool that allowed you to apply it quicker? And what if this tool was electronic? Would you use it? 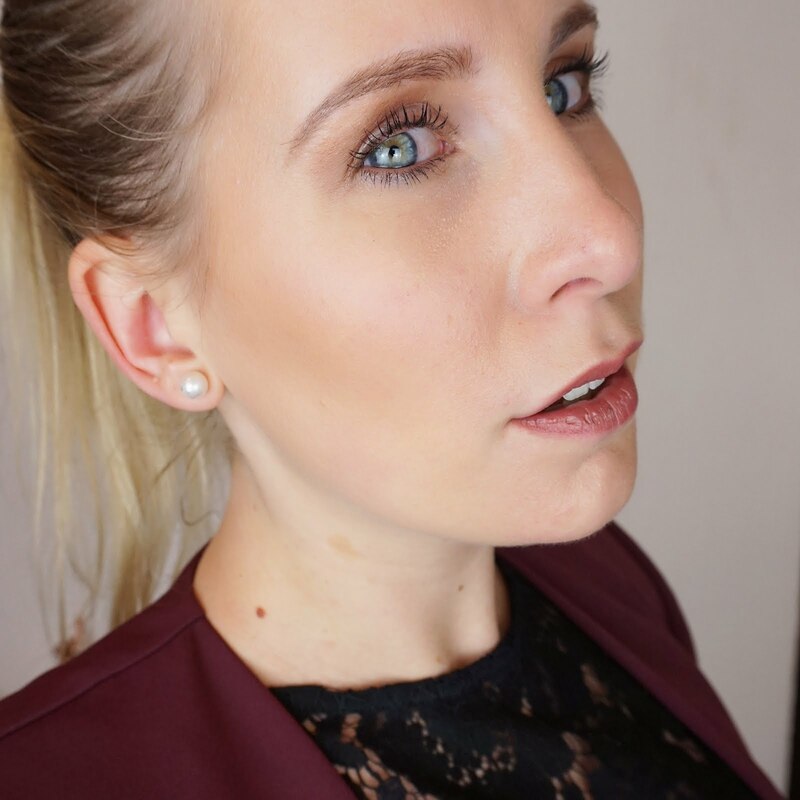 In this post I'm sharing everything about the Magnitone London BlendUp Vibra-sonic Makeup Blending Brush*. Magnitone London is a brand that focuses on bringing out the best in people, making our skin look the best it can be, full of radiance. It uses the Vibra-sonic technology, basically giving the skin a mini workout as it cleanses, massages and tones the skin at the same time. It probably doesn't come as a surprise that most of the tools Magnitone London sells are cleansers. They also have the BlendUp Makeup Blending Brush that uses the same technique but for the application of makeup. I must say that when I first heard about it, when it was launched in October 2017, I had my doubts. I'd never really considered applying makeup with an electronic brush and I was afraid it would just be another one of those gadgets. 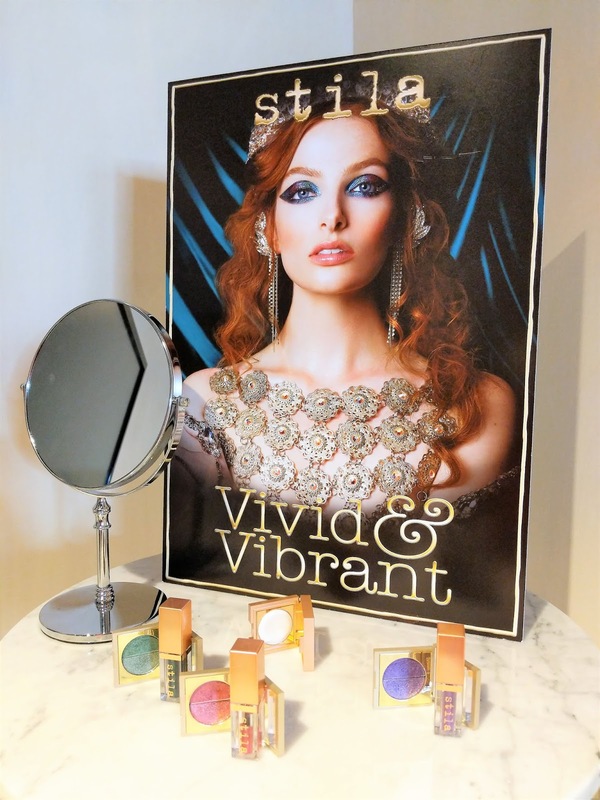 When I met the lovely Magnitone London team together with celebrity makeup artist Paul Herrington at Stylist Live in November, I thought this would be THE opportunity to try it out and see for myself! 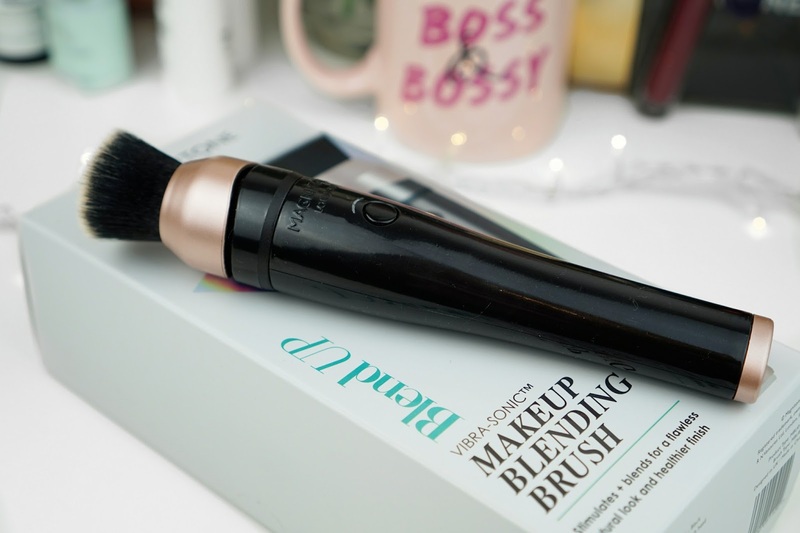 The BlendUp Vibrasonic Makeup Blending Brush comes in a white, stylish box and comes with one brush head, a manual and a USB charger. The brush is fully charged in two hours! 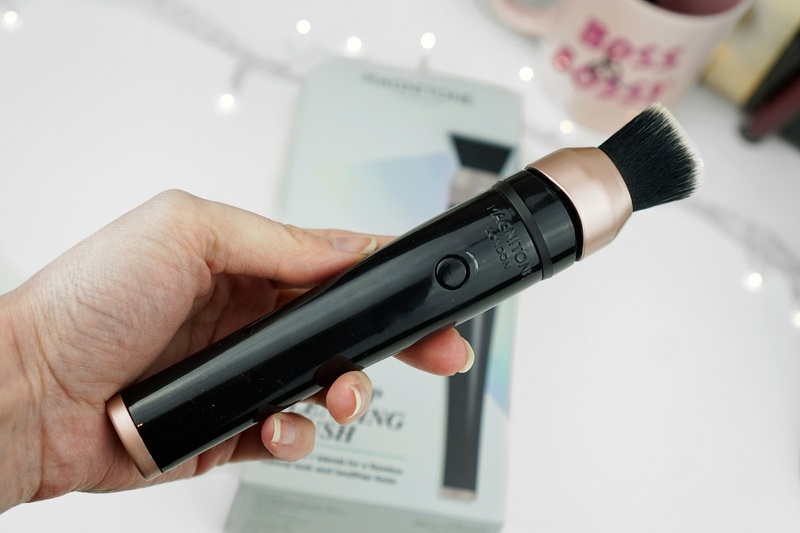 The BlendUp brush comes with a SmoothBlend brush head that is a dense, round brush with a flat top which is perfect for the application of foundation but also works well for contouring. The bristles are made with Biomaster antibacterial protection to avoid the growth of bacteria. 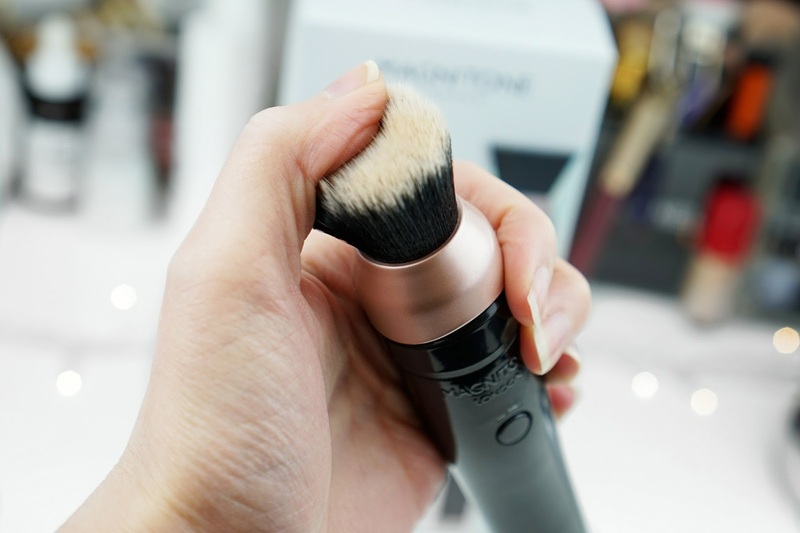 The brush blends in your makeup with 200 movements per second! The brush has two settings: blending and airbrush which is slightly quicker for a more flawless finish. If you're travelling and you don't want your brush to turn on unexpectedly you can lock it by pressing the power button for 5 seconds. The brush also has a self cleaning mode which can be activated by pressing and holding the power button for 3 seconds. Magnitone state that the brush can be used with all kinds of products, liquid, cream, stick foundations and powder. Sounds like an amazing product right?! The first time I used it, I followed the manual which states to move the brush from the nose towards the temple. It took a little getting used to, and I've found that moving the brush in circular movements works best for me, but I think I've mastered it now! 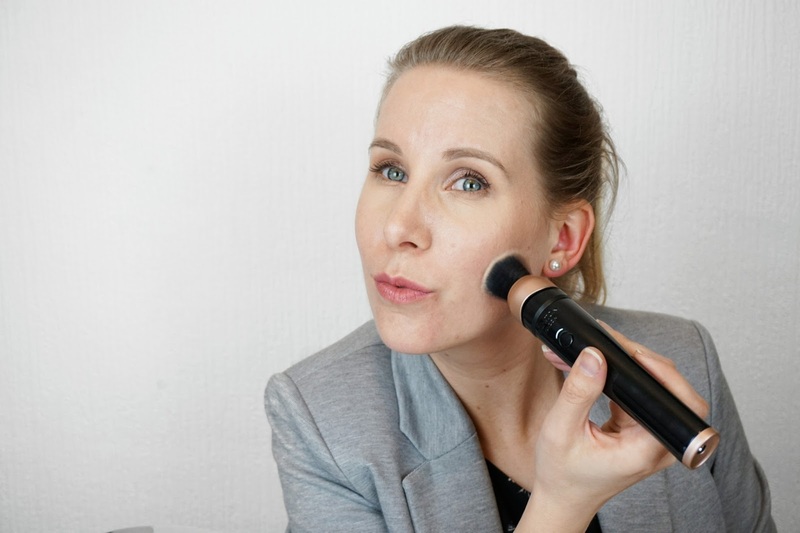 A little tip for you: if you're working with liquid foundations, apply a few dollops of foundation to several areas of your face first and work those in rather than applying the product directly to the brush (when I turned the brush on, the foundation kind of went everywhere!). I used the blending setting but the airbrush setting works pretty much the same. The bristles of the brush are super soft and I am so impressed with the result. My foundation looks flawless and at least just as good as when I apply it with my normal brush. 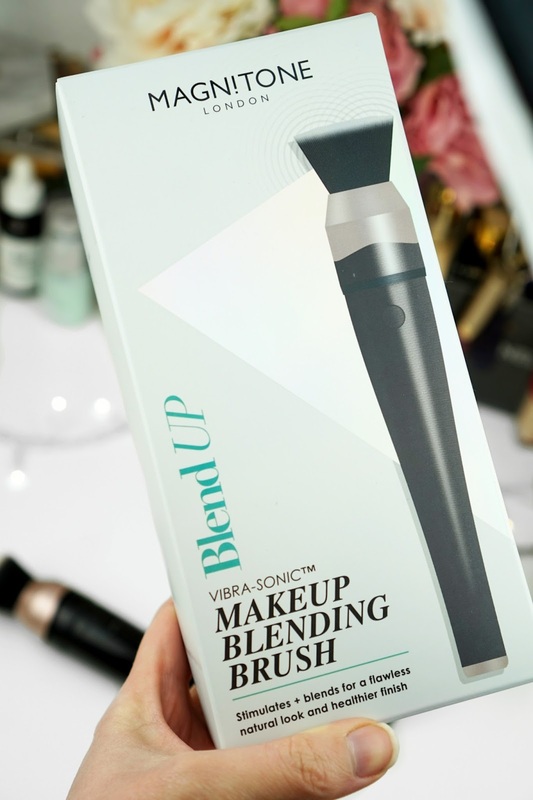 The BlendUp Vibra-sonic Makeup Blending Brush really cuts the time I need to apply my base in half and helps me get ready so much quicker! One tiny point of criticism (it's only a small one, I promise! ): The brush is on the heavy side, especially compared to a traditional makeup brush, so I wouldn't want to hold it for a long period of time. But as it applies makeup so quickly, this is not really a major issue. I love the design of the brush. It comes in black or white with gorgeous rose gold/copper colour details which is still so trendy at the moment. I've just used one type of brush but there are other types available if you want to expand it: a stippling brush and a buffing brush. In terms of using the brush for different mediums, it does the trick! I've used the brush for both liquid foundation as well as powder and it works like a dream for both. 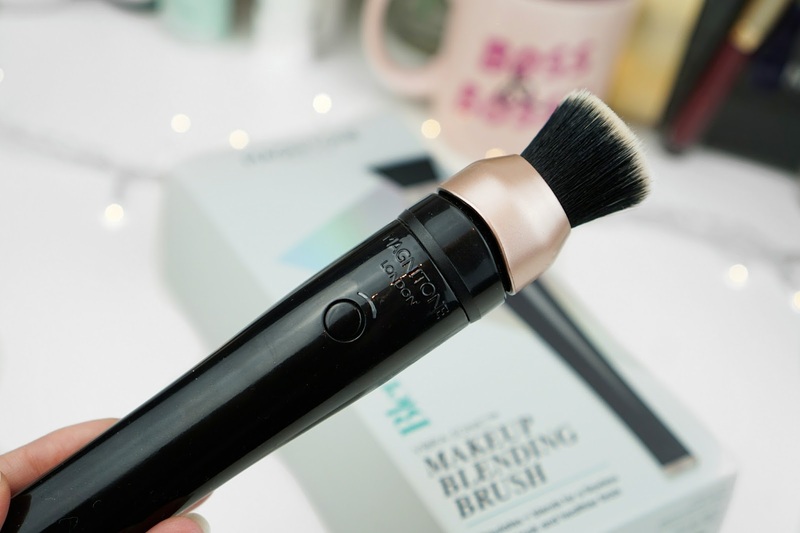 Also of you're thinking about getting one yourself, you might be lucky as the BlendUp brush is currently on sale on the Magnitone London website for £50 with the replacement brushes costing £18! Have you tried the BlendUp Vibra-sonic Makeup Blending Brush, or have you tried any other Magnitone London products? I would love to hear all about it! *PR/gifted - For more information and collaborations, please check the PR/DISCLAIMER page. I have not tried it but it looks so cool! !